According to Forbes magazine, her net worth is $900 million. This is mainly attributed to her having 100% ownership of Kylie Cosmetics. 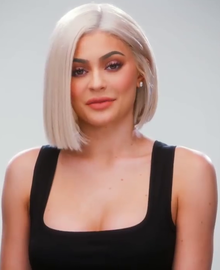 In an August 2018 issue of Forbes, they predicted that Jenner will become the youngest self-made billionaire ever, however others disputed the designation "self-made". ↑ Canal, Emily (March 2, 2016). "Kylie Jenner's Lip Kits, Social Status, And The Economics Of Scarcity". Forbes. สืบค้นเมื่อ June 21, 2017. ↑ "kylie-jenner-lip-kit-live-blog-all-the-updates-on-her-new-colors-and-when-shes-restocking". สืบค้นเมื่อ July 29, 2016. ↑ Jones, Tashara (September 24, 2015). "Kylie Jenner Lip Kit Live Blog: All the Updates on Her New Colors and When She's Restocking". New York Post. สืบค้นเมื่อ July 29, 2016. ↑ "The 25 Most Influential Teens of 2014". Time. Time Inc. October 13, 2014. สืบค้นเมื่อ June 18, 2015. ↑ "The 30 Most Influential Teens of 2015". Time. Time Inc. สืบค้นเมื่อ October 29, 2015. หน้านี้แก้ไขล่าสุดเมื่อวันที่ 1 ตุลาคม 2561 เวลา 05:24 น.